"You have a sense of some noble purpose to Irwin Winkler's creation of this movie. But it's a mess. The screenplay is the worst sort of hackneyed melodrama. The man who gave us "Airport" decides to handle the McCarthy disaster. To be effective as a disaster movie, the audience has to be brought to care about the protagonists. You have Robert DeNiro, the most amazing and hard-working actor of the last thirty years. You have other supporting players who are competent, dedicated and almost glad to be here. Even excellent acting cannot get the audience sympathetic for self-absorbed, narcissistic and uninvolved postwar moviemakers and stars. When a female character commits suicide, you are supposed to identify with her and feel a sense of tragedy. Instead, you feel something like relief that you don't have to listen to her any more. Liberal or conservative? Republican or Democrat? Hell, it really doesn't matter. You're almost more glad that the movie's over than glad that the McCarthy era ended fifty-plus years ago. " 1) Ebert: "But for the people who were caught in the Hollywood witch-hunt, beginning in the late 1940s, the decision meant, in many cases, betraying your ideals, or losing your job." JohnQuincy: A Witch Hunt implies that one is chasing phantoms not communists loyal to a foreign tyrant, Stalin, who were dedicated to the overthrow of the United States. Their ideals, the imposition of a totalitarian form of government, were worth betraying. 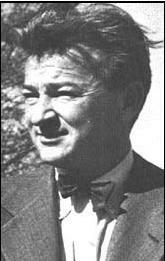 2) Ebert: "Most of those who testified before HUAC admitted their own political activities (for that matter, membership in any political party was perfectly legal, then as now, protected by the Bill of Rights)." JohnQuincy: This entire statement is misleading. Yes, most of those who testified before HUAC freely admitted their own political activities because most of the witnesses were friendly witnesses. Ebert is not drawing a distinction between the friendly witnesses and unfriendly witnesses. Further, while the Bill of Right does offer certain protections, nothing the HUAC did violated those protections. The committee was charged with investigating subversion and propaganda attacking the form of government guaranteed in our constitution. They had the authority to ask the questions and this authority was supported by the courts. The Communist Party via its own literature and by its own sordid history in other countries has shown been shown itself to be in favor of violent revolution and imposition of totalitarian rule. The below Summary of Legal Cases Against the Communist Party reviews some cases that the party has lost on this basis. Since the fall of the Berlin Wall and the brief opening up of Soviet archives, it has been well documented that the American Communist Party was acting as a paid agent of the Soviet Union. Since 1938, agents of foreign governments have been required to register with the United States government under the Foreign Agent Registration Act. This act has been around for over half a century. Tactic 4. "Make the enemy live up to its own book of rules." 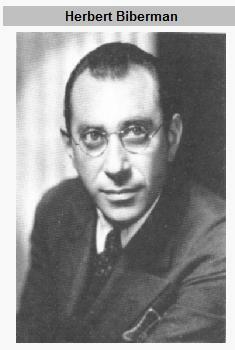 The HUAC Committee that investigated Hollywood was a direct descendent of Special Committee on Un-American Activities (1934-1937), which was chaired by Samuel Dickstein. With the brief opening up of Soviet intelligence records after the fall of the Soviet Union, it was revealed that Congressman Dickstein was a Soviet agent. It seems that the HUAC's methods were fine with the American Communist Party and their liberal allies when they were used on Stalin's enemies. JohnQuincy Reality Check: As foreign agents dedicated to subverting the constitutionally authorized form of government in the United States both the fascists and the communists should and did have the HUAC turned on them. The courts did not find the HUAC's actions to be unconstitutional in either case. One of these friendly witnesses was Ayn Rand who had fled the Soviet Union. She was particularly concerned about the wide spread employment of Communist agents in Hollywood and their successful efforts to inundate movies with propaganda. Rand: I ask you: what relation could a lie about Russia have with the war effort? I would like to have somebody explain that to me, because I really don't understand it, why a lie would help anybody or why it would keep Russia in or out of the war. How? Wood: You don't think it would have been of benefit to the American people to have kept them in? Rand: I don't believe the American people should ever be told any lies, publicly or privately. I don't believe that lies are practical. I think the international situation now rather supports me. I don't think it was necessary to deceive the American people about the nature of Russia. I could add this: if those who saw it say it was quite all right, and perhaps there are reasons why it was all right to be an ally of Russia, then why weren't the American people told the real reasons and told that Russia is a dictatorship but there are reasons why we should cooperate with them to destroy Hitler and other dictators? All right, there may be some argument to that. Let us hear it. But of what help can it be to the war effort to tell people that we should associate with Russia and that she is not a dictatorship? Wood: Let me see if I understand your position. I understand, from what you say, that because they were a dictatorship we shouldn't have accepted their help in undertaking to win a war against another dictatorship. Rand: That is not what I said. I was not in a position to make that decision. If I were, I would tell you what I would do. That is not what we are discussing. We are discussing the fact that our country was an ally of Russia, and the question is: what should we tell the American people about it -- the truth or a lie? If we had good reason, if that is what you believe, all right, then why not tell the truth? Say it is a dictatorship, but we want to be associated with it. Say it is worthwhile being associated with the devil, as Churchill said, in order to defeat another evil which is Hitler. There might be some good argument made for that. But why pretend that Russia was not what it was? 1. Don't Take Politics Lightly. 2. Don't Smear the Free Enterprise System. 5. Don't Smear the Profit Motive. 9. Don't Deify "The Common Man." 10. Don't Glorify the Collective. 11. Don't Smear the Independent Man. 12. Don't Use Current Events Casually. 13. Don't Smear American Political Institutions. Another friendly witness was Ronald Reagan. REAGAN: Well, sir, 99 percent of us are pretty well aware of what is going on, and I think, within the bounds of our democratic rights and never once stepping over the rights given us by democracy, we have done a pretty good job in our business of keeping those people's activities curtailed. After all, we must recognize them at present as a political party. On that basis we have exposed their lies when we came across them, we have opposed their propaganda, and I can certainly testify that in the case of the Screen Actors Guild we have been eminently successful in preventing them from, with their usual tactics, trying to run a majority of an organization with a well organized minority. In opposing those people, the best thing to do is make democracy work. In the Screen Actors Guild we make it work by insuring everyone a vote and by keeping everyone informed. I believe that, as Thomas Jefferson put it, if all the American people know all of the facts they will never make a mistake. Whether the party should be outlawed, that is a matter for the government to decide. As a citizen, I would hesitate to see any political party outlawed on the basis of its political ideology. However, if it is proven that an organization is an agent of foreign power, or in any way not a legitimate political party -- and I think the government is capable of proving that -- then that is another matter. I happen to be very proud of the industry in which I work; I happen to be very proud of the way in which we conducted the fight. I do not believe the communists have ever at any time been able to use the motion picture screen as a sounding board for their philosophy or ideology. "His career came to a halt in 1947, when he was summoned before the House Un-American Activities Committee (HUAC). 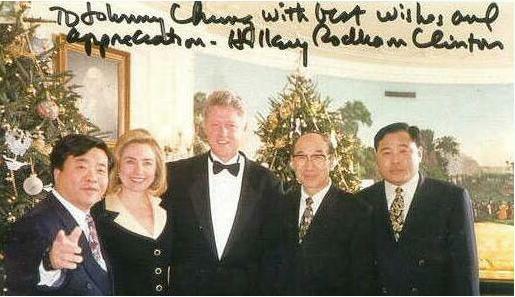 He refused to deny or confirm involvement in the Communist Party USA." 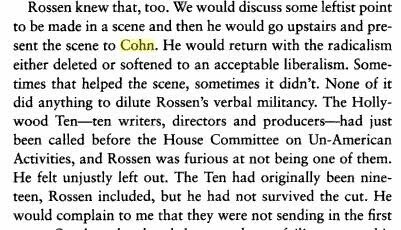 Fun Fact: Alvah Bessie was part of a Communist Party inquisition against director Robert Rossen. The party objected to the theme of the Rossen's film, "All The King's Men", which was that power corrupts. Rossen informed Alvah and other inquisitors that they could "stick the whole party up their asses." "In 1947, the U.S. House Committee on Un-American Activities began investigating the film industry, and Biberman became one of ten Hollywood writers and directors cited for contempt of Congress when they refused to answer questions about their Communist Party USA affiliation." Fun Fact: Unleashed from the shackles of Hollywood, Herbert Biberman was free to direct such classics as Salt of the Earth from 1954. According to Paula Kael, the famous film critic, the film was "as clear a piece of Communist propaganda as we have had in many years ...a proletarian morality play." "Cole appeared before the HUAC on 30th October, 1947, but he refused to answer any questions." Fun Fact: Cole once commented: " I read the Communist Manifesto of 1848...nothing seemed strange or unfamiliar to me. It was as if I had been brought up on this way of thinking since childhood." "Summoned to appear before the House Committee on Un-American Activities (HUAC), he refused to cooperate and was sent to jail. 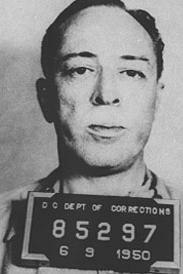 After spending several months behind bars, Dmytryk made the decision to testify again, and give the names of his fellow members in the American Communist Party as the HUAC had demanded. On April 25, 1951, Dmytryk appeared before HUAC for the second time, answering all questions. He spoke of his own Party past, a very brief membership in 1945, including the naming of twenty-six former members of left-wing groups. He explained how John Howard Lawson, Adrian Scott, Albert Maltz and others had pressured him to include communist propaganda in his films. His testimony damaged several court cases that others of the so-called "Hollywood 10" had filed"
Please take the time to read this fascinating article regarding Dmytryk's turn from the dark side: "What Makes a Hollywood Communist?" "Lardner appeared before the HUAC on 30th October, 1947, but , he refused to answer any questions." Fun Fact: To recruit new members, he proposed the slogan: "The most beautiful girls in Hollywood belong to the Communist Party." "Lawson appeared before the HUAC on 29th October, 1947, but he refused to answer any questions." Fun Quote: "I do not hesitate to say that it is my aim to present the Communist position and do so in the most specific manner." Fun Fact: During the 30s and 40s, John Howard Lawson conducted "Art as a Weapon Classes" that instructed members on how to insert bits of Marxist propaganda and the party line in films. 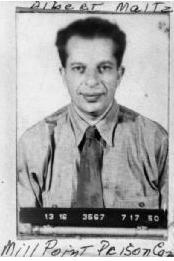 "Prison photograph of screenwriter Albert Maltz who, as one of the "Hollywood Ten", was jailed for his failure to testify before the House Un-American Activities Committee about Communist Party associations." Fun Fact: Albert Maltz briefly converted from the dark side via a February 12, 1946 article in the New Masses entitled: "What Shall We Ask of Writers." He later recanted his damning account of the impact of Communist ideology on art after an extended party inquisition. Summary of "WHAT SHALL WE ASK OF WRITERS?" in the Communist Review of October 1946. Here is a more recent article on the subject of Albert Maltz entitled, Art as a Weapon. "Ornitz appeared before the HUAC on 29th October, 1947, he refused to answer any questions." Fun Fact: Sam Ornitz, stated to the HUAC committee: “I wish to address this committee as a Jew." Curiously, he was one of the main apologists for Stalin's persecution of the Jews to the point of denying any persecution existed. "In October 1947, Scott was called to testify during the House Committee on Un-American Activities (HUAC) hearings on Hollywood but - as did nine others - refused to testify and was sentenced to jail. Edward Dmytryk, another of these Hollywood Ten, later, in 1951 testified before the HUAC that Scott pressured him to put communist propaganda in his films." Fun Fact: While he was all for protecting his constitutional rights, Scott had nothing against trying to deny them to others. Eward Dmytryk recalled being scolded by Scott for reading Arthur Koestler's Darkness at Noon and being told that party members were not allowed to read it. "Originally published in 1941, Arthur Koestler's modern masterpiece, Darkness At Noon, is a powerful and haunting portrait of a Communist revolutionary caught in the vicious fray of the Moscow show trials of the late 1930s. 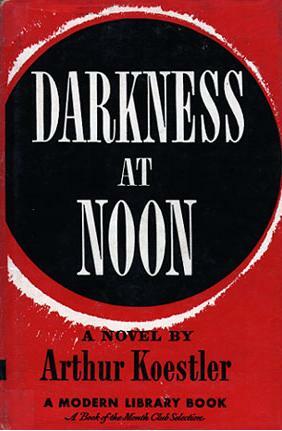 A seminal work of twentieth-century literature, Darkness At Noon is a penetrating exploration of the moral danger inherent in a system that is willing to enforce its beliefs by any means necessary." "In 1947, Trumbo, along with nine other writers and directors, was called before the House Un-American Activities Committee as an unfriendly witness to testify on the presence of Communist influence in Hollywood. Trumbo refused to give information." Fun Quote: "The important thing about a lie is not that it be interesting, fanciful, graceful, or even pleasant, but that it be believed." "To much of the public, however, it seemed plain that the Ten were merely being evasive, and probably because they were Communists, followers of a political line set by Stalin, a fact they were trying to hide by “exposing” the hearings as tainted by anti-Semitism. The strategy was a PR disaster, and in time most liberal support for the Hollywood Ten dissipated." To counter what they claimed were reckless attacks by HUAC, a group of Hollywood liberals led by actor Humphrey Bogart, his wife Lauren Bacall, John Huston, William Wyler, Gene Kelly and others, established the “Committee for the First Amendment” (CFA). The CFA traveled to Washington to lend its support as the eleven unfriendly witnesses’ began their testimony. However, as the eleven began to respond to their inquisitors with as much disdain, and often with histrionics far more brusque than their accusers, the embarrassed First Amendmenters began to unravel. Director Edward Dmytryk one of the Ten, said later, “I was so happy with the support of the CFA and others, but when (screenwriter) John Howard Lawson began haranguing the committee members, I died. We lost it right then and there!” Humphrey Bogart wrote a piece for the March 1948 issue of Photoplay magazine entitled “I’m No Communist”, in which he admitted being “duped”. His trip to Washington, he said, had been “ill—advised”. John Garfield wrote a similar article called ”I’m a Sucker for a Left Hook. Edward G. Robinson lamented “the Reds made a sucker out of me”. For all their breast beating about the first amendment and the sanctity of art, the blacklisted artists were nothing more than propagandists for the greatest tyrant in modern history, Stalin. Even more insidious, were their own efforts at blacklisting and censorship of authors. They often used their roles to get certain scripts rejected and keep certain writers from getting hired often by spreading rumors that they were anti-semitic. This post was inspired by the 1998 book, Hollywood Party, authored by Kenneth Lloyd Billingsley. Kenneth is one of the few willing to attempt to blow holes in the distortions so it is exciting to hear that he is participating in a new documentary, "The Liberation of One: The Defection of Romuald Spasowski." Attached is a link to an article that he wrote on Hollywood's Missing Movies in Reason. We have been educated in the myth. During that reign of terror known as the McCarthy era, congressional witch-hunts of Hollywood led to blacklisting that shattered the lives of thousands of innocents. 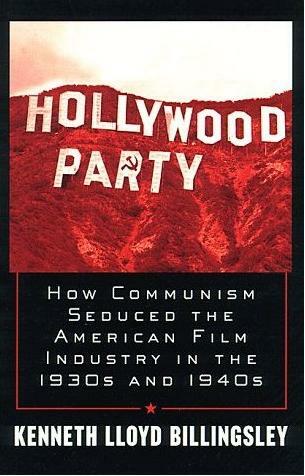 A recent book, "Hollywood Party," is an effective antidote to the prevailing Leftist version of what happened 50 years ago. Author Kenneth Billingsley details the Communist-Hollywood connection. Lenin himself recognized the power of cinema, saying "Communists must always consider that of all the arts the motion picture is the most important." His successor Stalin viewed film as "not only a vital agitprop device for the education and political indoctrination of the workers, but also a fluent channel through which to reach the minds and shape the desires of people everywhere." Communist infiltration of the American motion picture industry began in the trade unions. Expanding into the ranks of actors, writers, directors and producers wasn't terribly difficult. One writer for the Communist Daily Worker claimed that the established view among party leaders was that 99 percent of movie people were "political morons." Judging by the antics of today's Hollywood personalities, that figure hasn't improved. During the 1930s Communist opposition to the Nazi threat attracted substantial support from film stars and other influential folks from Hollywood. They ignored the obvious similarities between these two faces of Leftism - the mass murders and torture, the secret police, the suppression of the most basic rights, the intimidation, the focus on government rather than the individual, the total ignoring of man's spiritual side - and contributed their fame, money and time to Communist front organizations. Red influence in Hollywood was pervasive. One former Communist screenwriter noted that there were a number of "awful writers" who managed to get jobs only because they belonged to the party. For many Hollywood luminaries, anyone who opposed Hitler was their friend. Being a Communist was considered the same as being a Republican or Democrat or Prohibitionist or Vegetarian. It was simply a matter of which party you felt best represented your interests. The problem with that theory is that Communism was never just another political party; it was the only one directed from a foreign country. It was the only one that would have shredded the Constitution and immersed the U.S. into the subhuman slavery of totalitarian terror. It was the only one that considered Stalin, who made Hitler look like a piker when it came to slaughter, a god. Of course, not everyone joined the party or one of its many fronts purely for philosophical reasons. One actor told a potential recruit that "you will make out more with the dames" if he'd sign up. So he did. Throughout the 30s many in Hollywood, encouraged by comrades, agitated for America to assume an active role in crushing Nazism. Rallies, ad campaigns and fundraisers were held. America had a moral obligation to get involved. All of that changed immediately in 1939 when Hitler and Stalin joined in a pact. Now, the party line was that the U.S. had no business in interfering with the internal affairs of other sovereign nations. President Roosevelt was denounced as a warmonger. Even some of the dimmest bulbs started figuring it out when the Hollywood Anti-Nazi League transitioned into the Hollywood League for Democratic Action overnight. All they were saying, is give peace a chance. Less than two years later, when the Nazis invaded the Soviet Union, it was back to Plan A. Lurching back and forth didn't present any difficulty for the true believer. The party always knew what was best and no independent judgment was needed. Penetration of the film industry was sometimes subtle. One Red screenwriter and instructor counseled his students to get just five minutes worth of party propaganda in each film. Try to get the message across in dialogue from one of the major stars. This would make it less likely to be edited out of the movie. Sometimes the penetration wasn't subtle. Producer Hal Wallis, learning of an intended anti-Communist film, said not to even bother. The party would toss stink bombs into any theater attempting to show it. Rumors were started about actors who opposed the party. They'd be portrayed as pro-Nazi, knowing that Jewish producers would not be inclined to hire them. Controversy surrounded the honoring of director Elia Kazan at this year's Academy Awards. Kazan had done the unthinkable. He'd actually named names. His wife, Molly, has written about what many in Hollywood still characterize as witch-hunts: "Those witches did not exist. Communists do. Here, and everywhere in the world. It's a false parallel. The phrase would indicate that there are no Communists in the government, none in the trade unions, none in the press, none in the arts, none sending money from Hollywood to Twelfth Street. No one who was in the Party and left uses that phrase. They know better." Readers of "Hollywood Party" will know better, too. The fact that it is called the "red scare" or "McCarthyism" says a lot about how the post World War II communist problem is looked at from the modern perspective. From the earliest times I can remember gavels coming down by angry congressmen as meek witnesses calmly express their disagreement with a committee that would make them "name names." The witnesses seemed real pathetic and the committee chairmen all come off as power mad scoundrels looking for a headline. The poor Hollywood Ten went to jail or fled to Europe to write movies under fictitious names. 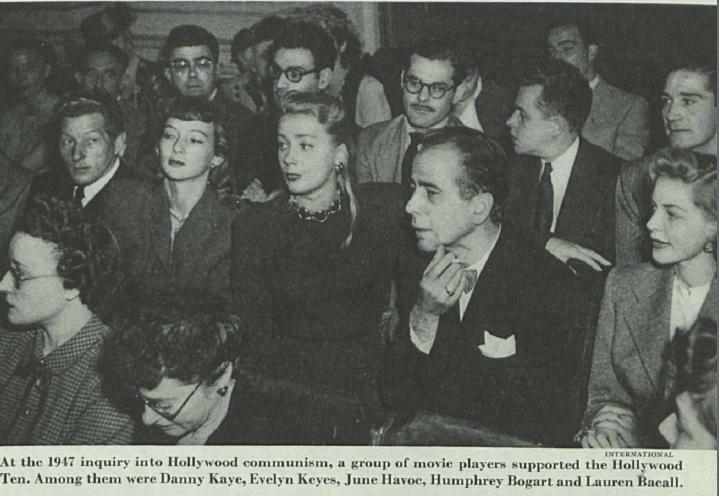 What none of the pictures or narration ever told me was that every member of the Hollywood Ten had been a communist at some point in his life and that half of the Hollywood ten were still communists when they went to jail for contempt of court. Since they weren't making the defense in front of Congress that they had the right to be communists, the event was portrayed as a "witch hunt." These were just misunderstood new deal liberals that wanted more socialism than the House Un-American Activities Committee. What Mr. Billingsley shows in his excellently researched book is that they weren't just a bunch of artistic idealists, but a group of avowed Marxists being funded by and taking orders from Moscow. It's not an open question. They were given orders to get collectivist messages into Hollywood films. They were told not to portray capitalism or businessmen in a good light. Writer Budd Schulberg was criticized by the party because his book "What Makes Sammy Run?" didn't achieve any of the party's goals. Some of these guys were even writing articles for the communist Daily Worker under their own names. Modern Hollywood liberals make the communist party members the victims of some horrible black period in American history without any thought to what Stalin was doing to his people in Russia (or would have liked to have done here). Somehow, the liquidation and forced starvation of millions is nothing compared to a few screenwriters that have to write under an alias. Quick can you name one innocent blacklisted person whose life was ruined? I can only think of the fictional Robert DeNiro character from Guilty by Suspicion. The character had to be fictional in order prove their dramatic point. Had they made the movie about a real person who went through such things he would have had to have been an actual communist. DeNiro plays a clueless liberal that is blacklisted because he was at a few parties. There weren't any of these misunderstandings in real life. Until I read Mr. Billingsley's book I had no idea that Hollywood was plagued by violent strikes in the 1940s whose purpose was bringing all the Hollywood trade unions under the control of communist, Herbert Sorrell. 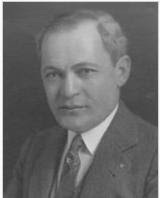 John Howard Lawson was trying to gain control of the Screenwriters Guild at the same time with the overall plan of controlling the content of Hollywood movies. Isn't it a little scary that this was being funded by a totalitarian government? None of the facts of this period are ever discussed. It's simply boiled down to communists as idealists and anti-communists as opportunists. In order to perpetuate that myth, Hollywood has since ignored the many opportunities to present the horrors of Communist Russia the way they have presented the horrors of Nazi Germany. The recent film, The Pianist, about Jewish life in World War II Warsaw, Poland doesn't even once mention that the Nazis and Russians divvy up Poland at the beginning of the war. All you hear is that the Germans invade in 1942 and the Russians liberate in 1945. That misses the whole point of what happened to Poland in the 20th Century. But it does perpetuate the myth. The tactic used in front of the committee hearings was to pretend that it was no one's business what their political affiliation was. That's cute, but would Hollywood have stood up for Nazis or Ku Klux Klan members under the auspices of first amendment freedom? The answer is readily available today. Mel Gibson's movie "The Passion of Christ" was roundly criticized for having the "wrong kind" of independent thought. They tend to like the kind of independent thought that also coincides with their prejudices like "Fahrenheit 911." Now that's free expression worth getting behind. 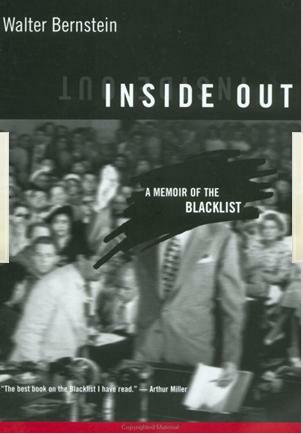 Mr. Billingsley's book is so on target with what isn't discussed by Hollywood when they cry about the blacklist that it will forever be an indictment of those people who perpetuate the common myth. All of this is baloney. There was no Communist infiltration of movies. 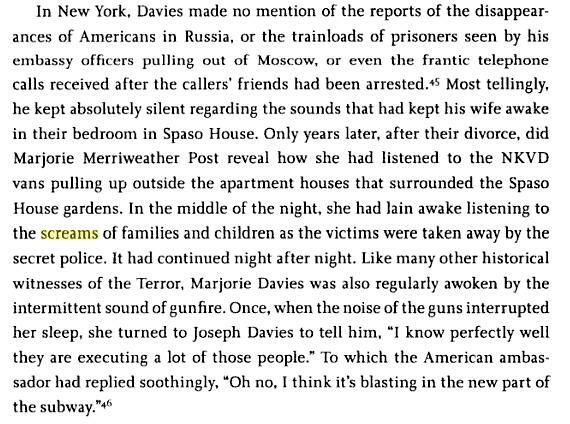 There were no Americans converted because of Mission to Moscow or Tender Comrades. The HCUA only wanted exposure. J. Parnell Thomas went to jail for extortion. HE was more un-American than any of the Ten. Communists in the 1930s were trying to help people. They were not trying to help Stalin rule the USA. Anyone who thinks that is....nuts! Nice articles, though, so thanks for the links!! Thank you for taking the time to comment. At JohnQuincy there is always room for polite disagreement. In one breath, you write that there was no Communist infiltration of the movies. In the next, you admit there was in at least two films, Mission to Moscow and Tender Comrades. You then question whether the films converted anyone. What is your point? Are you suggesting that the United States should have waited until Stalin's agents had perfected their propaganda methods and had started converting people? Technically, J. Parnell Thomas went to jail for embezzlement. If you want to quibble, traitors rank lower on the scale of un-American-ness than embezzlers. Again, what is your point? Does Parnell being an embezzler absolve one from being a traitor? Maybe I am nuts because I still do not see how introducing Communist propaganda into films under the direction of Soviet agents was meant to help people. In your eagerness to defend Communism, you miss my main point: A lot of these traitors were either bad artists or people who let their art get subverted. These very same people blacklisted others with more talent who did not tow the party line. “What Shall We Ask of Writers:"
“It has been my conclusion for some time that much of the left–wing artistic activity—both creative and critical—has been restricted, narrowed, tuned away from life, sometimes made sterile—because the atmosphere and thinking of the literary left–wing had been based upon a shallow approach,"
"I have come to believe that the accepted understanding of art as a weapon is not a useful guide, but a straitjacket. I have felt this in my own works and viewed it in the works or others. In order to write at all, it has long since become necessary for me repudiate it and abandon it”. You were correct that Mission to Moscow did not convert many people because it was dreck like much else that these people produced. Good stuff. Thanks for the research and summary. The left is and always has been a movement of fools and con-men. It's always interesting to explore the ideological roots of the current batch of liberal psychos busily destroying what's left of Western Civ in the name of "helping people".